Is my dream finally coming true? To own an Original Blackberry that I have been raving to everyone for the past thousands of centuries? My chance of winning one probably is 0.0000000001% but I'm still going to just give it a go. 1. Why you want to own a BlackBerry® Storm™ 9520? If you all realized I have been entering many various contest just to try my luck with some hope of winning a good mobile that will allow me to stay connected where ever I am. I have been dreaming of being able to go online 24/7, to check my emails whenever a new one comes in, to tweet my current thoughts, and to post online about the recent embarrassing moments of my life and etc. All my friend knows that if I'm rich all of the sudden, the first choice of mobile phone will definitely be a blackberry. LG is more of an affordable phone while Blackberry is the dream phone. For some reason, I'm still holding on my old clamp shell mobile even though it totally bailed on me a million times. Enduring the disappointments that I have on that phone as this time, if I am getting a new mobile phone, it must be wi-fi enabled! So important! Preferably enhanced touch screen so that I don't have to worry about losing those buttoned key-pads. It is so annoying especially when the words on the key-pads fades off, not only it defeats part of the purpose of a key-pad but also it will look freaking ugly. Huge internal memory, I just found out that I ran out of memory space while I was trying to key in new contacts. If this continues, I will probably have to go back in time and start using a triple five book (555) for my contacts and use a pay phone to call. Of course, great foundation allows great tall buildings. A potential of 32GB of space! It will fit me perfectly as my mobile phone is my MP3 player as well, I am finally free from repeating the songs in my songs list when I'm on a long commute. Imagine, I can finally watch movies, youtube, surf the net, blog, twitter, facebook and all the things I want to do on the go. No more forgetting the things I want to blog about when I come home at the end of the day. From my pervious post, I stated that I upload most of my pictures on FB now. Pictures can be uploaded at a lighting speed as that's what you get to have a HSDPA up to 7.2mbps! Lagging is way out of your problem list, surf the net without the need to wait for sooooo long. Yes, it's true! BlackBerry® Storm™ 9520 does all that! Why else will I want to own it?! 2. 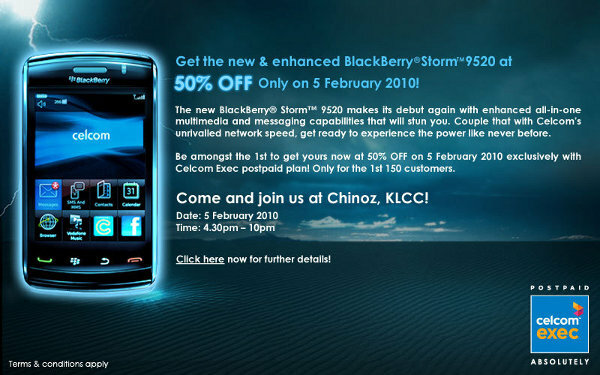 Why Celcom would be the best Storm-tastic place to get a BlackBerry® Storm™ 9520? Erm... Why NOT?! I was never a Celcom user. It would be a great way to start my connections with Celcom. 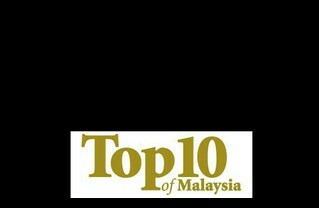 Besides, it's CNY, something new will be awesome. Then I can start comparing it with other phone services. It will be fun to be the first family member to use something out of the norm, I can try it out and if I love it, I will totally introduce them to my family members and friends. SO WHY NOT!